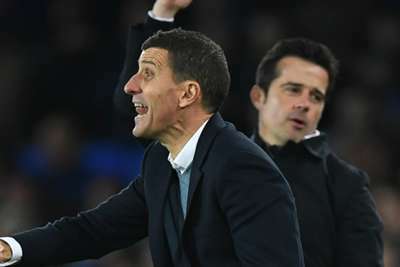 Watford head coach Javi Gracia joined the growing call for VAR to be introduced in the Premier League after seeing his side denied victory in a 2-2 draw at Everton. Some key decisions went against Watford in Monday's clash as Everton star Richarlison scored a controversial opener against his former club, converting after Theo Walcott had touched the ball in an offside position in the build-up. Everton defender Yerry Mina also avoided a second booking for a coming together with Isaac Success at Goodison Park. Watford initially showed good character to recover from the deficit through a Seamus Coleman own goal and a header from Abdoulaye Doucoure in quick succession, only for Lucas Digne to convert a stunning 96th-minute free-kick. However, Gracia felt that the outcome of the match may have been different if video technology had been in use on Merseyside. "I prefer not to say anything about the referees," Gracia told BBC Sport. "If VAR was ready today the result would have been different. I'm very proud of my players." Both incidents occurred in a relatively quiet first half in terms of chances, but the game exploded into life in the second period. Watford were on course for their first win in six league matches thanks to a two-minute turnaround, but Digne curled his set-piece into the top corner to leave Gracia feeling downbeat post-game. "It's difficult to accept because in the second half we dominated," he added. "To concede in the last minute is tough to accept but we’ll continue in the same way with the same attitude. "Only some difficult decisions to accept changed the game in the first half. After that the team was confident playing the same way."